Friday originally means 'Freyja's Day'. Freyja is a major Norse goddess of love, beauty and fertility. She is portrayed as blonde, blue-eyed and beautiful and people prayed to her - and still pray, since the traditional Nordic faith is officially recognised as a religion in Denmark - for happiness in love. You don't always have to ride. 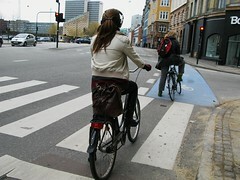 This Copenhagen Supermum padded casually down the street in the sunshine, eating a plum and chatting with her child. She rode effortlessly down the Old King's Road, music in her ears, smoking a cigarette in the most relaxed manner imaginable. 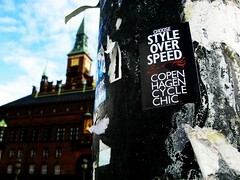 Sticker with city hall in the background. Spring is here and that means summer is sure to follow. 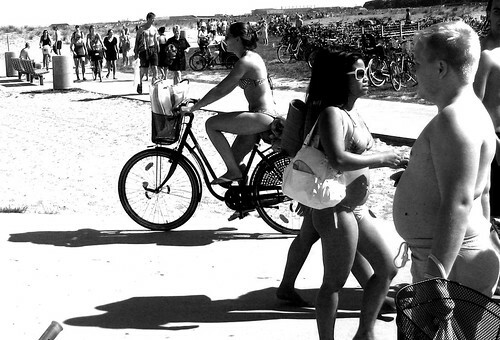 My family and I either ride our bikes [25 minutes] or hop on the metro [15 minutes] down to the beach at Amager Strand. We're all looking forward to the summer. 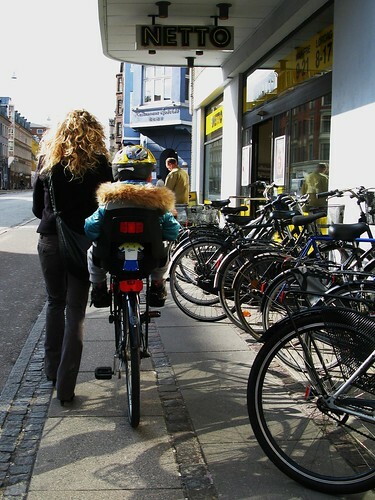 My favorite part of the first photo ("Supermum") is the bikes parked along the side. That must be common in Copenhagen, but if I saw that many bikes parked together here (Idaho, USA), I'd wonder what strange event was happening. Interesting Times article which might affect the hobby of some of us in the future. interesting link, westfield. an american export that has arrived in the UK but is unlikely to spread to Europe by all accounts. there is a greater tendency here to respect street photography as an art form.